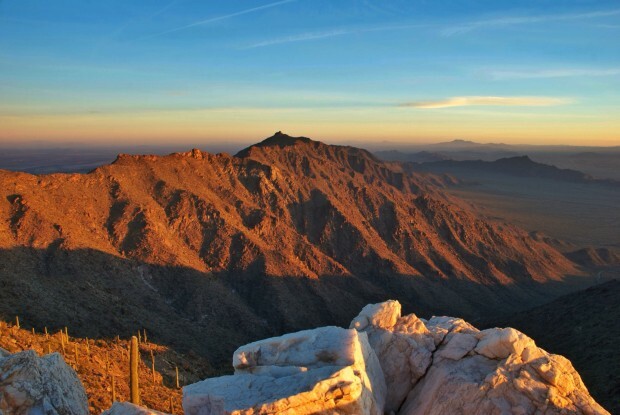 Estrella Mountain Regional Park is home to almost 20,000 acres of natural land in its original state. It offers over 30 miles of trails for hiking, mountain biking, and horse-back riding. Hiking trails range in length from 2 miles to 8 miles, and range from easy to strenuous. The Base Line Trail is a relatively easy 2 1/2 mile hike, or the Pederson Trail which covers almost 9 miles is an excellent all-day hike. In February of 2000 the park completed their competitive mountain bike track designed for high speeds. The track consists of 13 miles of exciting bicycling. There are two loops in this track, the larger loop is approximately 8 miles long. Although the course is challenging, it is geared towards bicyclists of all skill levels. However, the 5 mile loop is far more intense and only exert bicyclists should venture that course. Horse riding on the Estrella Mountain Regional Park is also popular activity. The horse riding trails are shared with hikers and bicyclists. One should be mindful when using these multi-use trail to be courteous of others for everyone’s enjoyment and safety. Camping space and RV sites are available too, with water and electricity hook up. Yet ground camp is only permitted for up to two nights at a time. Picnic tables, fire rings, and restrooms are provided by Estrella Mountain Regional Park. Special sites can be reversed for many diverse groups of various sizes. The Tres Rios Golf Course is another great attraction at the park. The golf course is known for its peaceful surroundings, shady areas, and abundance of wildlife. Tres Rios Golf course was established in 1962 then completely renovated in 1998. In 2000 Estrella Mountain Regional Park’s golf course was voted as one of the top five most improved golf courses in America. It continues to be excellent choice for golfers of all skill levels. Fishing in the Gila river is one of the many draws to the Estrella Mountain Regional Park. The Gila River is the habitat for multiple species of fish. There are both native and non-native fish that make their home along the Gila river. However, Fishing at the park has a “Catch and Release Only” policy. The Estrella Mountain Regional Park is full of adventure and fun for those who seek it.